Full-length, standing in a landscape, facing the spectator, holding his cocked hat in his right hand and wearing the uniform of a British general, with riband and star of the Order of the Garter; on the left a member of the Chevalier Guard leads away his charger. A study for this painting is in the Russian Museum, St Petersburg. It was copied, on a smaller scale, by William Corden (RCIN 406751). 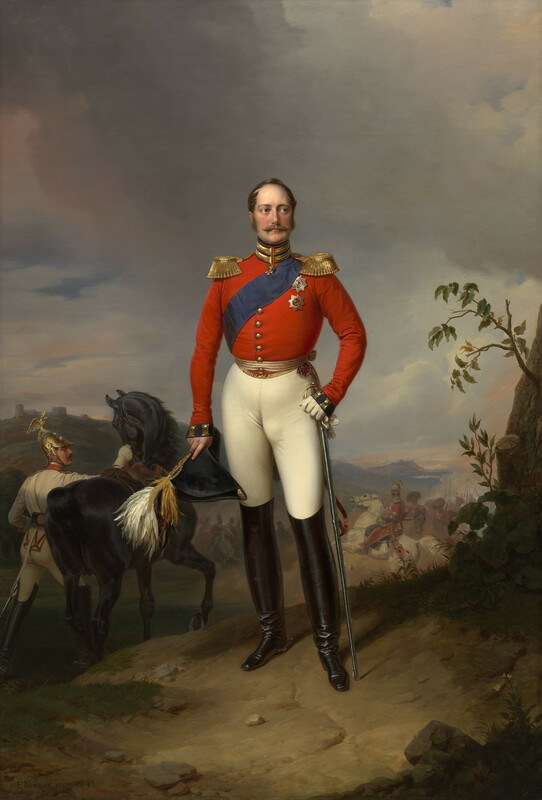 Tsar Nicholas I (1796-1855), third son of Tsar Paul I and Maria Feodorovna, daughter of Frederick, Duke of Württemberg, succeeded to the throne of Russia in 1825 following the death of his eldest brother Alexander I, and the renunciation of the throne by his second brother, Grand Duke Constantine. His aggressive interest in Turkey culminated in the Crimean War, which had not been concluded at the time of his death in 1855. Franz Krüger (1797-1857) trained under the printmaker Carl Wilhelm Kolbe. He was given a place at the Academy in Berlin in 1812, although he continued to train independently. Among other subjects his hunting and stable scenes found favour in Prussian society. The Napoleonic wars inspired him to paint military subjects, and he achieved success with works such as March of the Prussian Cavalry (1820; Doorn, Huis Doorn). His portrait of Prince August of Prussia (c. 1819; Doorn, Huis Doorn) won him access to the patronage of the court. In the representation of historical events Krüger was able to successfully combine portraits and genre painting; this talent is shown in his painting of the Large Parade on the Opernplatz, commissioned by Tsar Nicholas I of Russia (1830; Berlin). In addition to the respect he had gained at the Prussian court, he was esteemed as a portrait painter in the courts of Hannover, Schwerin, and in St Petersburg, where he spent the years 1836, 1845, 1847 and 1850–51. He became the favourite court painter of the Tsar, of whom he completed many portraits, including this one and a spectacular equestrian portrait, currently at the Historical Museum, Moscow.